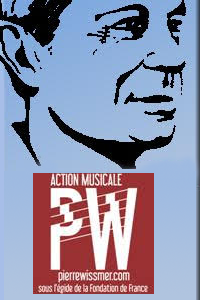 Action Musicale Pierre Wissmer was founded in 1995 under the aegis of the Fondation de France with the purpose of making the very diverse œuvre of this original composer more widely known. Numerous concerts, several recordings, articles and publications testify to the vitality of the association. AMPW supports all projects emanating from orchestras, instrumental ensembles or soloists, pertaining to its purpose. If you would like to submit a concert or recording project involving compositions by Pierre Wissmer, please send a full dossier with the detailed project to Action Musicale Pierre Wissmer (see address above). The annual submission closing date is November 30. Download logo of the association. Download IBAN of the association.